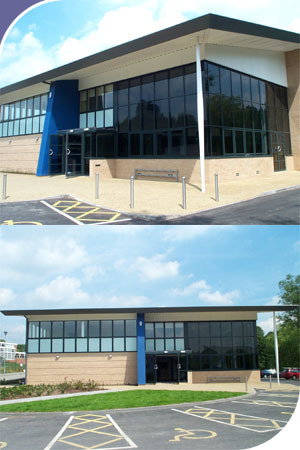 We have recently completed the construction of Hannage Brook Medical Centre in Wirksworth, Derbyshire. The new purpose built centre integrates a six doctor surgery with individual consulting rooms, a physiotherapist, a chiropodist, the doctors records and practice manager, and a pharmacy at ground floor level with the doctors common room and community health service offices and staff facilities at first floor level. The building occopies a site at the base of the hannage brook valley, on the banks of the brook, and has views out from the double height waiting room to the south and west. The consulting rooms have been grouped around the perimeter of the floorplan to maximise natural light and ventilation. The waiting room has full height solar glazing and large overhanging eaves to help minimise solar glare.